June | 2014 | I run. Quite a lot. It makes me happy. The holiday this year was a few days in Pembrokeshire. Exciting for 2 reasons. I have only been once and loved it. Nick grew up there, so it was a great chance to visit places from her youth. I know that holidays are a time for rest and relaxation, but I relax via the means of exercise. I’m useless at sitting around doing nothing. I get a bit annoying. So, we get to St David’s. The capital of Pembrokeshire and the smallest city in the UK. It’s beautiful. As we were there outside the school holidays, there weren’t too many people around and most of them were at least 15 years older than us. 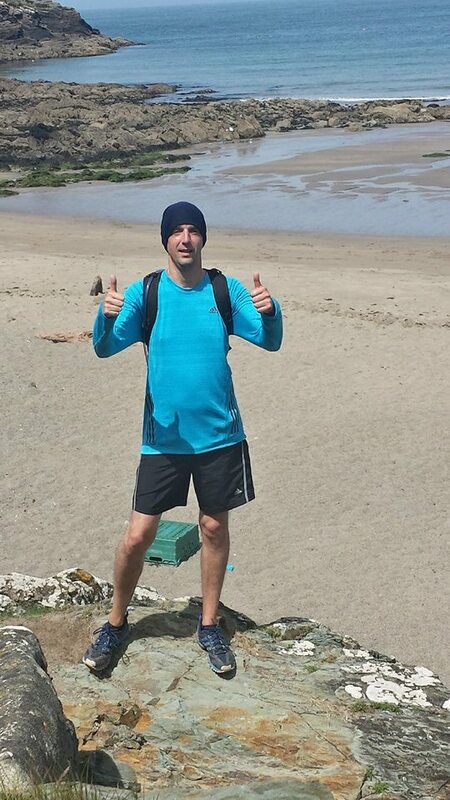 We managed to get 3 days out on the Pembrokeshire Coastal Path. It is amazing. As a runner and lover of the outdoors, if you get the chance to go, it is well worth the effort. The 2 big expeditions that we did were from St David’s to Newgale via Solva and from St David’s to Porthgain in the opposite direction. Although both of the big outings were run/walks, I’m pretty sure that we can count them as training, especially given the undulating, technical nature of the terrain and the fact that they were 10 and 19 miles each. The beaches are fantastic. Admittedly, it does help if you have nice weather, and we were certainly lucky on that front. At several points on the runs, the path was around 3 feet away from the edge of a 300 foot drop onto the rocks below. As the path was rocky, you had to look down to keep your feet. This is very disorientating when the sea is moving down below. I did feel ‘a bit funny’ at times, it has to be said. I think that Wales will now become a regular holiday destination and we will be looking out for an event to do there next year. Everything is now geared towards the Downlink Ultra in October. I entered the Lemmings Marathon this week. It is 106 laps of a 400m track. For a lot of people, this would seem like a nightmare race. However, it seems like a good idea to me. A perfect long run that fits into the training plan, flat (which is the same as the Downslink) and I can have my food there and I plan to eat at distances that replicate the aid stations on the Downslink. Plus, the Sussex Trail Event people organise top races. Anyway, that’s it for now. Enjoy the weather. Let’s hope it doesn’t get too hot. There are a lot of miles to get through over the next few months and I don’t do hot very well.